Elephant creamer, sold at the Cross in Yaletown. Photo courtesy of the Cross. O the mighty elephant, proud and majestic. And also pretty cute as crockery. I found this baby for about four bucks at the Yaletown store the Cross. Isn't he precious? 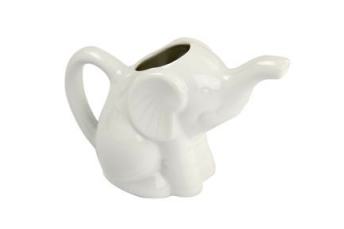 They also carry an elephant teapot, sugar bowl, and salt and pepper shakers. But I prefer to mix up my crockery, so I will balance the cuteness of this creamer with a warm minimalist teapot and mugs by the Finnish design company Tonfisk.